Alontae Taylor has a dream. In 2018, he’ll be moving up to the next level. And give up calling plays to catching passes as a wide receiver at the University of Tennessee. Rated as a 4-star player and the #4 wide receiver in the country, Alontae, is focused on his ultimate dream of playing in the NFL. He doesn’t see himself playing quarterback professionally, even though several major college teams would have given him a scholarship to play QB. In addition to his elite speed, Alontae also has vision and you can see it in the way he runs. Look at the way he changes course and how often he runs untouched. And he maneuvers through life much the same way. Taylor spoke with Jauan Jennings, another high profile high school QB who successful transitioned to wideout at TN, and set his course. He likely could have played four years as QB in college and then transitioned to another position, but he wanted to be really prepared for his shot at the pros. Alontae’s approach on his life is very similar to the way you should approach the market in Nashville. 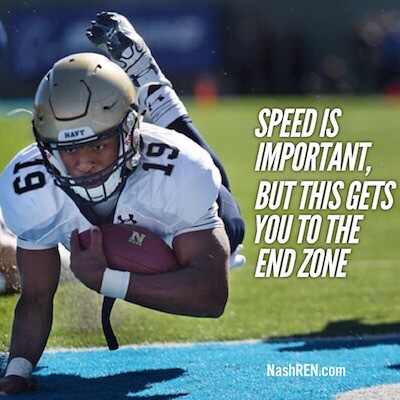 Speed is important, but your vision is what gets you to the end zone. Gretchen and I have twenty five years of combined experience in this market. We have personally sold more than 500 homes all over Middle Tennessee. And we want to share that knowledge with you. If you have questions about the market in Nashville that will help you see things clearer, then hit reply and send us your concerns. We promise to answer to every one. The Daily Deal in Nashville is Gretchen’s latest listing in Bellevue. It would make a great starter or investment and is listed for less than $185,000.